A tough musical book and a visually demanding uniform concept are two of the challenges facing the Blue Stars as they continue their quest to rejoin Drum Corps International's elite top 12. 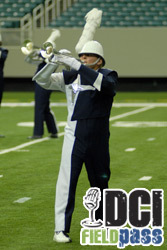 Dan Potter talks with Blue Stars director Chad Armbruster in today's Field Pass. Download and listen now. (MP3, 3.6MB) Listen through iTunes. Subscribe to this podcast.